This arch style framed wall mirror is the perfect accent for a sophisticated home. This decorative framed wall mirror features an inner and outer antiqued champagne silver finish with a gray glaze. This design adds style as it gives a room-expanding look to a smaller space or dark hallway. This eye-catching design is by Grace Feyock for Uttermost. 21" wide x 35" high x 1" deep. Hang weight is 29 lbs. Glass only section is 15" wide x 30" high. Surrounding frame is 2 1/2" wide. 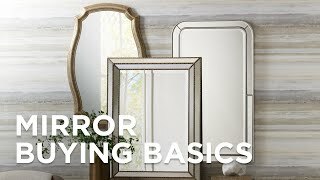 Silver wall mirror designed by Grace Feyock for Uttermost.